Annual industry forecasts for Alaska, Anchorage, the Fairbanks area, and Southeast Alaska; and ten-year industry forecasts for Alaska. Occupational forecast looks at individual occupations and projects their growth over ten years. Subscribe to receive e-mail updates on our data. 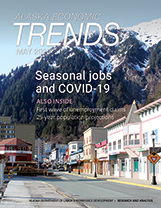 Alaska Economic Trends is a monthly magazine that covers a range of economic issues. To subscribe to the free electronic version, click here, email dolsharedragroup@alaska.gov, or call (907) 465-4500. A paid print subscription is also available through Assets, Inc.
SEARCH TRENDS: Trends is searchable from 1978 through now. The search can include any combination of the title or subtitle, date or date range, author, or full text.